Samantha, who has kept her full name a secret, first told a contact at the DCCC last year about the harassment. She says the behavior occurred in the form of unwanted touching and sexual advances while she worked on Kihuen's successful campaign for Congress. She quit in April of 2016. 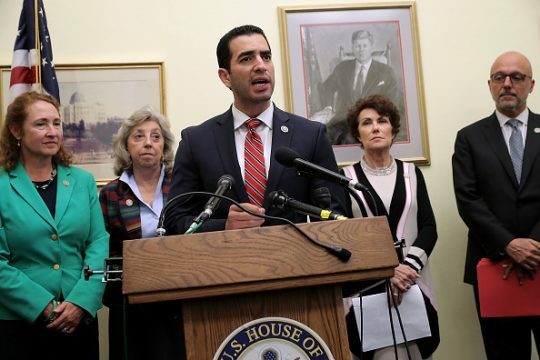 Since she came forward with her story in a report by BuzzFeed, other women have alleged inappropriate behavior by Kihuen, and top Democrats have called on him to resign. Kihuen has made no indication he will, but said he will cooperate with the House Ethics Committee investigation that was launched Friday, BuzzFeed reports. Samantha said she has yet to be contacted by the DCCC. "It took a few days before I started wondering why no one has contacted me. I knew they definitely had my contact information," Samantha told BuzzFeed in an email. "Even if they didn't have any questions about the incidences, I was surprised they didn't at least contact me to apologize to me, since I clearly tried to report this a year and a half ago and nothing happened." "We respect and believe Samantha, and that’s why we took swift and strong action in response to her coming forward," said Meredith Kelly, communications director for the DCCC. Since Samantha's story was published, DCCC chair Rep. Ben Ray Luján (D., N.M.) has called for Kihuen's resignation, as has House Minority Leader Nancy Pelosi (D., Calif.). However, Kihuen claimed they both knew about the allegations last year and spent money on his competitive race anyway. "I do find it interesting that the DCCC, Leader Pelosi and Chairman Ben Ray Lujan—they knew about these allegations last year," Kihuen said. "They looked into them. They didn't find anything, and they continued investing millions of dollars into my campaign. They went out there and campaigned for me." Pelosi and the DCCC said Kihuen's remarks were inaccurate. This entry was posted in Politics and tagged Buzzfeed, DCCC, Nancy Pelosi, Sexual Harassment. Bookmark the permalink.